Jockey Eddie Aceves rode Getoutofthefastlane to victory in the second of two trials for the Double Down Derby on Saturday at Sandy Downs. IDAHO FALS, ID�AUGUST 22, 2015�Getoutofthefastlane destroyed the field in the last of two trials on Saturday for the $30,000-est. Double Down Derby at Sandy Downs. Ridden by jockey Eddie Aceves, the IVORY JAMES gelding defeated Nurse Hawkinson by 2� lengths while clocking a :19.585 to get the top qualifying time. He earned a 109-speed index for the effort. The stakes-placed 3-year-old entered the trials off a third place effort in the Adequan Les Bois Park Derby on July 29. Michael Monson conditions the brown gelding for owner/breeder Byron Goody. 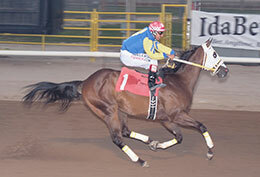 The Idaho-bred, out of Cruel Summer by Streakin La Jolla, has won three of eight career starts and earned $12,603. For a list of the Double Down Derby qualifiers, their times, sires, dams, owners, breeders, trainers and jockeys CLICK HERE.